If you know me, you know that I am OBSESSED every little extra something to make one wedding stand out from the rest! I found someone who feels exactly the same way! Maria at Tupelo Honey knows just how to add that extra touch to her stationery to kick the paper goods up a notch! From lace, to ribbon, to wax, and wire, her invitations are simply a work of art! I am SO happy to share all of the awesome stuff that WEDDING CHICKS offers to their brides…FOR FREE! Templates for save the dates, invitations, reply cards, monograms, totes, favors, etc. etc. So much awesomeness for free! And it all goes so well with the vintage stamps posted last week! This goes out to all of my vintage loving, blog reading, detail oriented girls out there! I die over vintage stamps. Look how fantastic a couple of beautiful stamps and awesome calligraphy can make a plain piece of paper look! 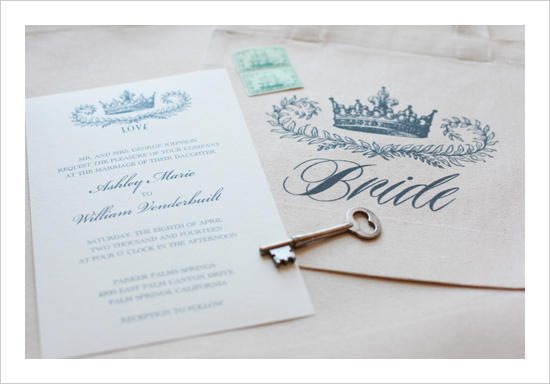 The color and creativity that something as simple as a stamp can add…I love it! Now it can get pretty pricey if you mail every invite with vintage stamps, but if you’re in love with these stamps as much as I am, I’ve got an easy solution! Save one special invitation suite for your photographer to capture on wedding day- with unique and colorful vintage stamps to dress it up!